Ron L. Meek of Greenwood, IN passed away peacefully on the afternoon of March 25th surrounded by family. He was born September 19, 1930 in Glasgow, KY, and grew up there and in Franklin, IN. He was the son of Lucille Crenshaw Meek Hefley and Ben Meek and the step-son of Jess Hefley. For much of his and his older brother Bennie's life, they were raised by their loving, tenacious mother. At the age of 17, wanting to serve his country as well as see the world, he joined the US Navy. After training at the Naval Station Great Lakes, he was assigned to the USS Peregrine minesweeper which patrolled the eastern seaboard and took part in experiments with anti-rolling equipment for ships in rough seas and water safety equipment including life jackets and rafts. When the Korean War broke out, his discharge was frozen. Having seniority over those being drafted, being a good typist, and wanting to see a bit of the world, he chose duty at the US Navy Department in London, United Kingdom. After a year, he was assigned duty to open the 6th Fleet office in Naples, Italy and served there for a year. Upon returning to London, he met and married his first wife, Jean McArthur, from Edinburgh, Scotland in 1953. Upon his honorable discharge, they settled first in Franklin, IN and then Greenwood, IN. They had three sons: Rondaul Gary, deceased while serving in the US Marines, and Scott and Gavin. Jean died in 1986 after a five year battle with cancer; throughout her illness, Ron faithfully and lovingly took take of her. Spending time with his grandsons, Ryan and Matthew, attending their school and sports events brought him great joy; they were crazy about their grandfather and all were very close. He met and married Debby Goldsberry in 1996 and they enjoyed, among other things, cruising and travel. In 2008, they adopted Lyric, Debby's granddaughter, who had been in their life from birth and made her their daughter. Lyric brought great joy to their lives and he was a proud, affirming, protective, and somewhat indulgent father; he was always encouraging of her and never missed anything in which she participated. Ron joined the Greenwood Presbyterian Church August 28, 1955 where he was the longest serving member, very active and a longtime Ruling Elder. He retired from Amtrak, Beech Grove in 1992 where he was a welder for over 30 years. In 1968, he began a 35 year stint working the weekends of May at the Indianapolis Motor Speedway as a "yellow shirt" security official. He was also a delivery driver for Graphic Resources of Indianapolis for 6 years while in retirement. Ron was very involved in the Greenwood Little League, coaching all three of his sons and countless other boys for a total of 18 years. His hobbies were his family, first his three sons and then Lyric, as well as his church. His children and grandchildren as well as Debby would consider themselves to have been blessed. He is survived by wife Debby, daughter Lyric Kimberly both of Greenwood; sons Scott Brian of Greenwood and Rev. Gavin Douglas (Jennifer Kottler) of Florence, South Carolina; three grandchildren: Ryan Meek (Heather) of Greenwood, Matthew Meek of Indianapolis, and Linda Meek Graves of Hot Springs, Arkansas; one step-grandson; four great-grandchildren; and three great-great grandchildren. 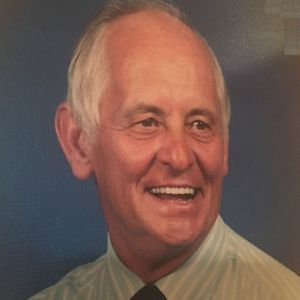 He was preceded in death by his parents Lucille Meek Hefley and Ben Meek, step-father Jess Hefley, his brother Bennie, first wife Jean, son Rondaul Gary and step-daughters Kimberly Klepfer and Kyla Goldsberry. Visitation will be on Friday, March 29 from 4:00 p.m. until 8:00 p.m. at the Wilson St. Pierre Funeral Service & Crematory Greenwood Chapel, 481 West Main Street, Greenwood, IN 46142. A Service of Witness to the Resurrection and Celebration of Life will be on Saturday, March 30 at 11:00 a.m. at the Greenwood Presbyterian Church, 102 West Main Street, Greenwood, IN 46142 and a reception provided by the church family will immediately follow in the Fellowship Hall. The family requests that in lieu of flowers gifts be made in his memory to the Memorial Fund of the Greenwood Presbyterian Church. Add your thoughts, prayers or a condolence to Rondaul's guestbook.